When choosing a camera I wanted to play it safe and go for something established. The starlight SVX was temping but I ended up buying a second-hand ST-8 and filter wheel. The camera has parallel download (not an issue I thought as I would be watching TV while my automated system download the images) and the non blue enhanced chip. My initial sessions with the camera during early autumn were quite disappointing. I was only getting the CCD of –5’C and had lots of thermal noise. So off the camera went to SBIG for the cooling upgrade. This gives the camera a second stage of Peltier cooling and a water heat exchanger. SBIG recommend an aquarium pump to circulate the coolant. As these pumps can not pump a great head of water these only work if there is no air in the system. I am using a peristaltic pump that is not dependant on a closed loop. The coolant is anti freeze, not for its cooling properties but because it doesn’t freeze in winter! Now –30’C is achievable most nights and backgrounds a lot less messy. The camera has a built in guide camera. In order to work a bright star need to be placed in the CCD. 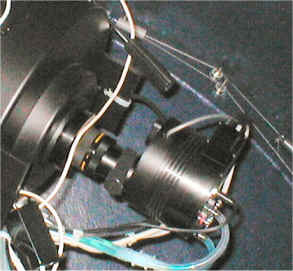 For many objects the camera would need rotating to get both object and guide star on there respective CCD’s. 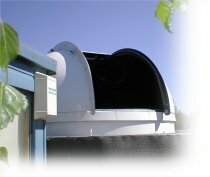 Not so go for automated observing. I tried using a piggy backed ETX90 with a starlight MX5 as a guide camera but the relatively small aperture and long focal length again cause problems in finding a guide star. 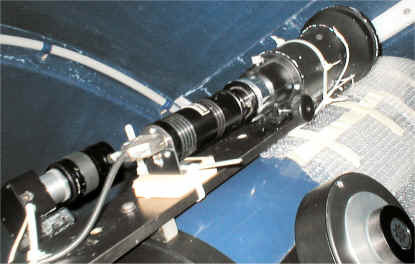 At the moment I as using a home made copy scope as a guide scope. This is made from a lens from a photocopier and a piece of drainage pipe. The focal length is only 250mm but coupled with the small pixels of the MX5 and the sub pixel guide routines its guides the ST8 well and only needs 2 sec exposures where ever in the sky the scope is pointing.